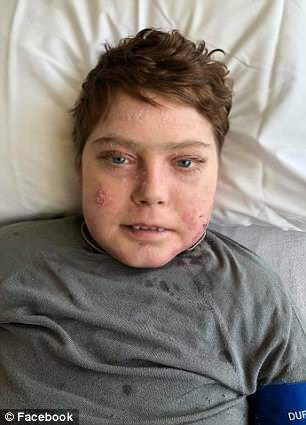 The Canada teen known as 'the Butterfly Child' for his rare and excruciatingly painful skin condition has died at age 17. 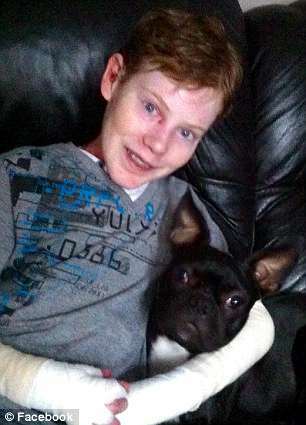 Jonathan Pitre suffered from epidermolysis bullosa (EB), one of the most painful diseases in the world in which the slightest scratch can cause painful blisters. His story went viral two years ago when opened up about the condition to a local paper in Ottawa, Canada, in 2014 and revealed that he had never had a pain-free moment, even during his sleep. Jonathan will be remembered as the face of EB after he devoted his life to spreading awareness for the debilitating disease and raising more than $200,000 for affected families. Canadian prime minister Justin Trudeau and others have paid tribute to the 'courageous' teen who died last Wednesday at a hospital in Minnesota. 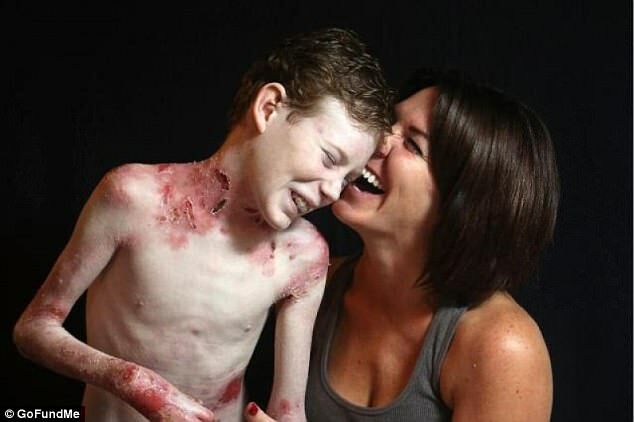 Jonathan was one of fewer than 17,000 'Butterfly Children' in the world with EB, a rare genetic condition that makes the skin as fragile as butterfly wings. While healthy skin is made up of three layers, Jonathan's was missing the middle layer which holds the inner and outer layers together. As a result, even the smallest trauma to the skin would cause deep, painful wounds that could never heal. 'It's called one of the worst diseases known to modern medicine for a reason. 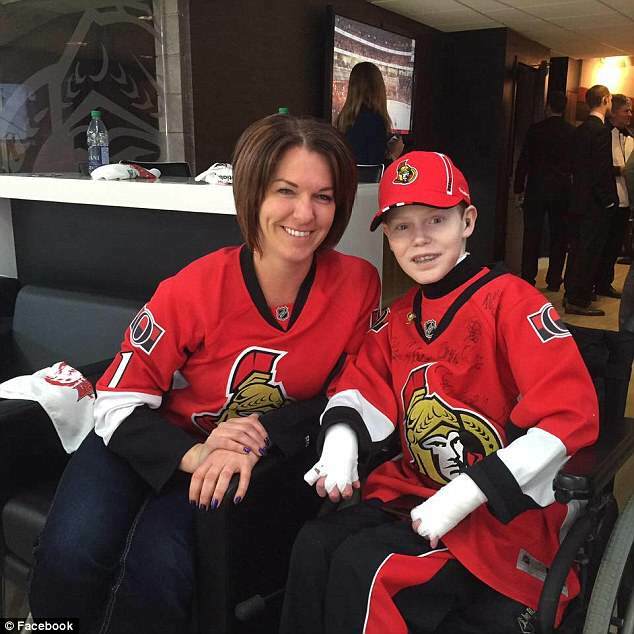 The worst disease you've never heard of,' he said in an ESPN segment called The Butterfly Child: Jonathan Pitre. 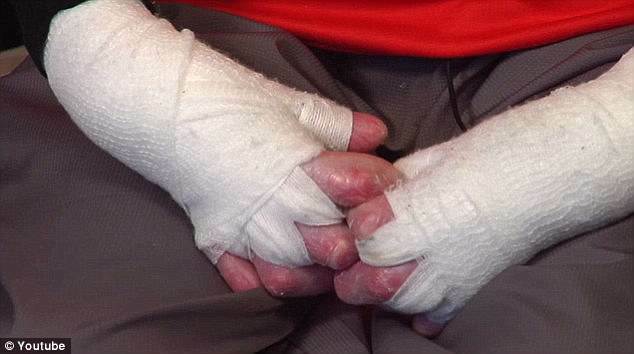 There is no treatment or cure for Jonathan's condition, so he managed it with daily wound care and protective bandaging. He was not expected to live past the age of 25 unless a cure was discovered. Last year he underwent an experimental stem cell transplant that had the potential to dramatically reduce his symptoms, but since that procedure he had cycled in and out of the hospital with infections. 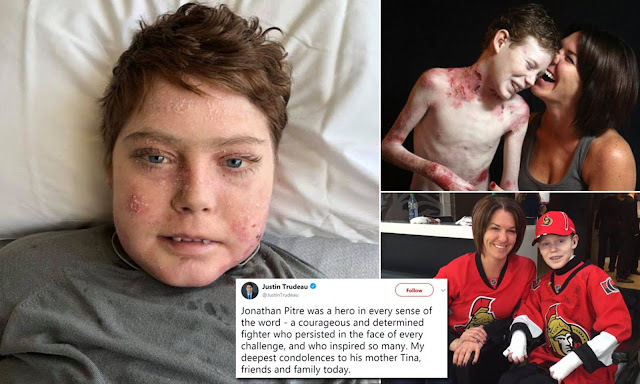 Jonathan's mother Tina Boileau told the Ottawa Citizen he had been fighting an antibiotic-resistant skin infection for three weeks when his fever spiked on March 30 and he was hospitalized. The next day his blood pressure dropped but he was still in good spirits, so Boileau stayed positive. 'We figured it was just his infection working. We had been down this path before,' Boileau said. On April 2, Jonathan started to have difficulty breathing so he was moved into the intensive care unit where doctors worked to reverse his septic shock, the body's toxic response to infection that wreaks havoc on the organs. His condition continued to deteriorate as his lungs filled with fluid, kidney's failed and heart stopped. Ultimately on April 4, Boileau brought her son back to his familiar hospital room and tucked him in with his favorite blankets. The 17-year-old died that night. She posted about her son's death on Facebook calling him a 'fearless warrior'. 'Jonny's story has been made very public over the last few years as he invited you into his life and his daily struggles with EB as he tirelessly fought to raise awareness for this horrific disease,' she wrote. Jonathan had raised more than $200,000 for Debra, a charity for families of people with EB. On Friday the organization posted about his death on Facebook. 'We are deeply saddened to share the news of the passing of Jonathan Pitre, a true EB champion,' the post says. 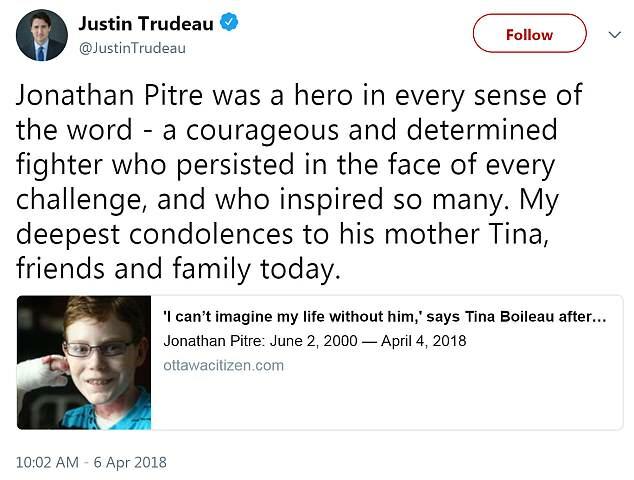 Trudeau also tweeted about Jonathan's death on Friday. 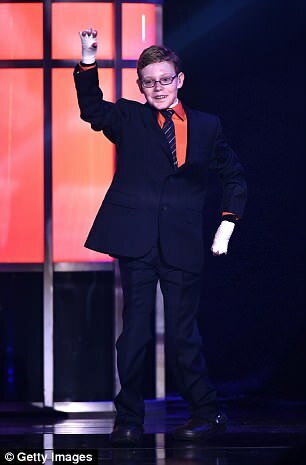 'Jonathan Pitre was a hero in every sense of the word – a courageous and determined fighter who persisted in the face of every challenge, and who inspired so many,' he wrote. Two National Hockey League teams, the Ottawa Senators and Pittsburgh Penguins, also paid their respects to Jonathan, an avid hockey fan, before a game on Friday night. The teen had loved hockey and gym class until his condition progressed to the point that he could no longer play. Instead he turned his focus to other aspects of sports including sportscasting and coaching. He was known as very mature for his age, which he credited to his condition. 'Because I can't play sports, I stay with the adults. So I guess I had to kind of grow up faster,' he told the Ottawa Citizen in 2014. He also loved reading science fiction and was working on a book of his own when he died.